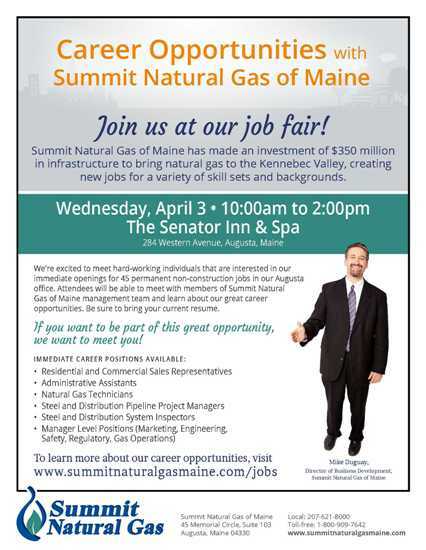 Summ it Natural Gas of Maine announced the Augusta-based company will host a job fair for 45 current career opportunities on Wednesday, April 3 from 10 a.m. – 2 p.m. at The Senator Inn & Spa at 284 Western Avenue in Augusta. The job fair is for the company’s current positions for permanent non-construction jobs at the company’s Augusta office. Rock Coast Personnel and KMA Consulting will be present to assist in facilitating the job fair. Additional information available in this Job Fair Flyer. This entry was posted in Helpful Tips, Job Seeker Tools, News and tagged human resources, interviewing, job, Job Search, succeed.